The Secret Seven by Enid Blyton – It's Time to Read! It’s their very first adventure and the Secret Seven super-sleuths are already on the trail of a mystery! The gang are dressed in disguise, following a lead to a spooky old house in the snow! I love Enid Blyton! I need to just get that out there. Last year I read The Enchanted Wood and loved it! I also read 5 out of the 6 Malory Towers books. I loved them too! It is probably just nostalgia that makes me rate these books so highly but to be honest, I loved them as a child; and I can’t lie, I love them as an adult. I can’t wait to read them to my children when they are older. I love collecting them and re-reading them. Because of this, I have set myself the challenge to read all the Secret Seven books this year. I can now check the first one off the list. And yes, I did very much enjoy this Enid Blyton story too! 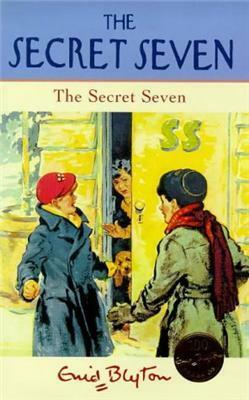 The Secret Seven is a great introduction to the seven children – Peter, who leads the society, Janet, Colin, Jack, Pam, Barbara and George; plus Scamper the dog. They are seven children looking for fun, so they create a secret society. We learn that before Christmas they had helped out in the community, but since it was just after Christmas and everyone had been looked after they were seeking something fun to do – maybe even solve a mystery! It is Jack who stumbles upon the mystery at the old, deserted house. When he is heading home at night he hears a car pull up and a very strange noise coming from the back. What is it? Who are the people moving things in the night? How is the old house connected? This is a mystery for the Secret Seven to solve! I did really enjoy this book. There are some books which can be enjoyed by both adults and children – even when the intended audience is children – and I think this is one of them. I was immediately sucked into the adventure and the society with the secret password and the special badges. It reminded me of the games I used to play with my friends – although I never crept around creepy old buildings! I didn’t notice the age of the book either. Enid Blyton wrote this book back in 1949, but it didn’t feel dated. Sure, the children weren’t using telephones or email to communicate, they wrote letters – but surely children in secret societies still do that? I didn’t feel the age of this book hindered it at all. The story was exciting and fun. My addition is only 117 pages long, with large print and illustrations, so it took 45 minutes to read; however it was 45 minutes of joy! The children are cunning and adventurous. They have to be brave and sometimes they are a bit naughty and reckless, but that makes for more fun reading about them! The story has suspense – it may even be a little frightening for the younger reader, but of course it has a happy ending. This book might be a bit twee, but I think we need that sometimes. I have high praise for this book. It was a nice way to spend a quiet evening at home while my husband is out. I really enjoyed being transported back into a world of fun, secret societies and mysteries. I enjoyed this book as a child, and I have enjoyed it as an adult. It isn’t a tough read, but it is exciting and I am looking forward to reading it with my children. I am rating this 4 out of 5 because it was a book I really liked. It isn’t my favourite childhood book, but I love the author and I love re-reading her books. Reading through this series is going to be a fun challenge!